I think this is about the 5th or 6th vacation I have taken with Collette. I feel safe and know they will touch on the highlights of the countries or towns we go to. This trip was a trip of a lifetime. I enjoyed each and every day and they took us to the places I had read about in books.. So enjoyed London, York, Edinburgh and Stonehenge. The group leader was excellent and kept us informed at all times and made sure we enjoyed each day. Michelle was sweet, kind and very helpful when I was having a hard time. Our tour guide helped us find ATMS that would take Discover Card. She also helped me find a drug store to find medicine for my cold. Also, in Scotland I was very sick. Our guide bought me some crackers to help my stomach. I enjoyed all the sights. I especially our sight seeing in London. Duncan, our guide was knowledgeable,friendly, and very fun to see the sights with. The tour was too hurried, poorly planned, e.i. We went to Westminster Abby on Sunday & you cannot go into the Abby as a group tour; did not receive my packet nor detailed info prior to the afternoon of the 1st day. We went a day early and had no info while we were sightseeing on our own. Had to worry about the time our group was to meet! Lucky, we got back to the hotel prior to the group leaving the hotel for dinner! Spent a night in the Wales castle - didn't have time to see the castle during daylight hours, nor see the town. This tour did not measure up to the previous tour we had with Collette's tour of Christkindle markets earlier in 2001! See my earlier comments. Why? More site time, less bus. Too much bus time, not enough time at site locations. Thank you for traveling with Collette on our British Landscapes tour. Your feedback will be reviewed by the Product Development Team to enhance this itinerary for our future guests. Wonderful hotels, terrific head tour guide as well as local guides. Bus and driver Skippy, A Plus. All the cities we visited were very interesting and well worth the time. The only draw back in my opinion was the very early starts to the day when going from one place to another. London, Edinburgh, York & Stonehenge. Wales in Stratford where my favorite places. However we did not stay nearly long enough in the castle and wales. I could have easily done without going to Stonehenge. We had just a really short time and the lines were very long. Thank you for traveling with Collette on our British Landscapes tour. Your feedback has been forwarded to the Product Development and Tour Management departments. This feedback will be used to enhance this tour for our future guests. Tour guide was friendly, informative and super helpful. Trip was well planned, hotels were in excellent locations and we had free time to do our own thing. I plan on using this agency again in the future. A group of 42 was a bit large but guide was very organized. I had booked the earlier tour for August which included the military tattoo but we got moved to Sept. The Scottish night experience was a little too touristy and too long, and this replaced the tattoo. So that was a disappointment for our British Landscape tour. CAROLYN FROM AVOYA TRAVEL WAS JUST GREAT ALWAYS GOT RIGHT BACK WITH ANSWERS TO MY QUESTIONS. ALL DOCUMENTS WERE ACCURATE AND ON TIME. Some memorable experiences included Stonehenge, London in general, a Scottish Night Out, and the scenery while on the bus. The weather could not have been better! The service was excellent. I checked with Collette a few times before the trip and they were easy to work with and they answered my questions. Their service on the trip was excellent and the tour manager took care of us and answered all of our questions. There were so many memories that we made on this trip, but my favorite was Edinburgh Scotland and the castle we stayed at in Wales. We are an ideal match for Colette> We are retired now and live in a rural area of northeastern pa. and it is somewhat involved to get to Newark. we appreciated the door to door pick up and the extra effort it took to find us in the woods and transport to the airport. We signed up for all the optional tours on the trip and the tour guide and transport was great. All the services provided on the tour were great and the accomodations and food was great. This was our second trip with Collette. We had a fabulous time! Our tour guide, Lorraine Robertson, was very professional & very entertaining! We had such a great time that we already booked another trip with Collette fro next April! We enjoyed it. But it was too much traveling between cities on the bus, only to spend one night at the next town. (London to York...Edinburgh to Wales) We both felt that 2 nights in each location would have been better...to be able to see more of each location. THE TOUR MANAGER, BRIAN, DID A GREAT JOB. THE LOCAL GUIDES WERE ALSO VERY GOOD, AND THE LOCATIONS VISITED WERE ALL INTERESTING. WELL WORTH THE MONEY. THE ENTIRE TRIP WAS WITHOUT ANY SIGNIFICANT PROBLEMS. Brian was professional and courteous. He went the extra mile to make sure that everyone was taken care of, any questions were answered, and was very knowledgeable regarding all areas of our tour. He also had a sense of humor whichm for me, makes a tour even more pleasant and fun. Everywhere we went was awesome. My favorite experience of Ruthin Castle. I only wish we could have spent more time there exploring the grounds. Well coordinated from pick up at the airport to drop off at the airport at trip's end. Outstanding sampling of England, Scotland , and Wales. I wish there was more time in London. I would recommend anyone taking this tour either come in 2 to 3 days early or stay that long after the tour. London has too much to offer and 2 nights and 1 day is insufficient to see this great city. An excellent trip. Well planned an guided by a true professional! We saw the beautiful countryside lined by years old stone fences and manicured hedges. Not as organized as some tour companies . Seemed confused by logistics. Took us to wrong terminals at airport etc. Too much free time. Tour guides and bus driver were very good. Interesting places to visit. Most of the hotels were comfortable. Food was good except for the optional Scottish show. Thank you for your feedback. A member of the Guest Relations Team will reach out to you to discuss your comments. We enjoyed the trip overall. I enjoyed the trip but thought more time was needed in York and would have liked to have seen Ann Hathaway's cottage and taken the Avon River cruise. I think tips for local guides should be included. It is hard to always be looking for change to tip. The hotel in Scotland was in a poor location . Loud noise from pubs across the street. Scotland and Ruthin Castle were my favorites. Good tour just not enough time in York to see things I wanted to see. One day in London - not enough. Trip was for the most well planned out and included a lot of high points in short period of time. There was at least one major hiccup that stated the trip off on the wrong foot. First night where all travelers were to have dinner and meet each other never happened. The transportation to the restaurant was messed up and people waited for more than an hour to get there. Unfortunately most people got tired of waiting and went off on thier own . Four of us who were traveling together went our separate way for dinner. Not a disaster but left a bad feeling right out of the gate. You tried to put at least one too many things in the to do package. For example thr trip to Stonehenge was to not good. Way to little time to even visit the museum or gift shop. Hello Vernon, thank you for sharing this feedback with us about the tour. We have passed this along to members of our team for review. \n\nWe appreciate you and value your insight as it helps us to improve our tours for future guests. We look forward to traveling with you again soon. The service was good. Restaurants that were included in the tour were not within 10 min. from the hotels. One was a good 40 min. walk. Not happy about that. Being picked up from home to airport & airport home was a nice service. Tour manager was very knowledgeable, BUT very unorganized. On return trip home not enough time to get from hotel to airport in London. Upon arrival at airport had only 45 minutes to go thru security, check in and arrive at gate. Over all, a good trip. The only negative was the bus itself. No enough leg room, seats were hard and uncomfortable. We should have traveled to a better portion of Hadrian's wall. The section we got to see was disappointing. From my research there were much better examples of the wall we could have visited. Hello Glenn, thank you for sharing this feedback with us about the tour. We have passed this along to members of our team for review. We appreciate you and value your insight as it helps us to improve our tours for future guests. We look forward to traveling with you again soon. The tour was quite rushed. I would have liked more time in York and Wales. Our guide provided no daily written information, not even a list of email addresses for everyone. She was fun, but became short when we couldn't hear instructions while huddled on busy streets. We even left one person behind and just happened to see him on the street and stopped for him. Of course, he was that person who was always late, but you don't just leave someone! Stonehenge was a bucket list item for me, but the Jorvik Museum in York was a neat surprise. Loved the pick up and drop off services. Saw many sites of interest. Nice hotels, in general. I loved the tour in Edinborough Scotland. The castle, Holyrood, and the dinner were great. Since you don't provide space for criticism, I am adding it, here. The average age is over 65. If you are going to get us up early and run all day, it might be wise to have earlier dinners. People were exhausted. Also, the farewell dinner should not be on the last night, but the night before, so everyone can pack and relax before flying home. I have other suggestions, but, I think you don't want to hear them. Great itinerary, excellent guide, awesome driver - what is not to love?? The Military Tattoo, Stratford-upon-Avon tours, and Stonehenge visit were all fabulous - I can't pick just one! Our tour manager was excellent and kept us informed on the trip with the history and highlights of the areas and even had some local music to play while on the bus. The dinners that were included were all very good as were the optional dinners. They added to the whole experience. Loved the restaurants in London and the farewell Shakespeare show and dinner. The hotels were average to excellent, but all in great locations, so this might have been the best choice for the location. The British Landscapes Tour had a lot of driving between sights which made for some long days, but that meant we were able to see a bit of England, Scotland and Wales. The people on the tour were all very friendly! Everything was well planned and carried out. Visiting the Palace of Holyroodhouse in Edinburgh and visiting Shakespeare's grave in Stratford-upon-Avon. All details are taken care of and thought out. All of our needs were always met with a smile. One of the things I loved about this tour was the diversity among the places visited. Collette seemed to have covered all of the areas that appeal to visitors...the only problem is that you fall in love with a city or town and wish you could stay longer. That's the sign of a good tour for me. This was our fourth Collette tour and possibly the best. The arrangements were very good at each of our four hotels. One hotel I would not recommend that they use again, but the number of hotels in that town may be limited and the company may not have many choices. The tour manager, *personal details removed by Feefo* was superb. She had a great attitude and was willing to share her knowledge of the areas that we visited. Great locations and well planned daily tours. Super coach drive and brand new ride. Very "on time" attendees. England, Scotland and Wales are stunning in the spring! Well paced tour. Guide was considerate to a fault and very knowledgeable. Hotels were all good except for Ruthven Castle. That is NOT a luxury hotel! Interesting to visit and look around, maybe have dinner, but rooms were below average. Beautiful drives through the countryside! London hotel was perfectly located for walking near the Thames and the Tower. Right near Piccadilly tube station too! Very organized and thorough. Personnel seem genuinely interested in making sure the experience is fun and informative. Could have spent s little more time in London and maybe had a your in the tower of London. The office staff was always pleasant and cooperative. I made a change to the airport pickup/drop off and they were happy to oblige me. They even mentioned a discount that I didn't know about. The trip went smoothly with no major problems. I have travelled with Collette previously and always found them to be courteous and helpful. Everything on this tour was great. Our Group Leader was helpful and kept us informed and if there were changes to the itinerary he let us know in plenty of time and explained our options. The hotels were comfortable and the provided meals were excellent. Some of the hotels were "quaint" but they were usually located near restaurants and shopping. The Ruthin Castle was a grand experience even though it was a bit off the beaten path. The peacocks were awesome! The most memorable experience was riding through the Lake District. The green fields and grazing sheep were the quintessential experience of the English countryside. There were too many delays getting tickets, vouchers etc. though the tour manager tried to get it straightened out I don't feel there was much support for her regarding the issues. The hotel rooms didn't really accommodate 3 people they also had a few problems regarding our dietary needs. For the amount of money we paid I would have appreciated more in depth touring. Not just looking out the window at iconic places but actually going inside them. Especially in London. Tour is very quick and cursory. It's a good overview of the the island I just wish it was more in depth. Hotels were nicely located, tour director and coach driver were great. Tour should be 1 day longer, spend 1 night in Oxford rather than 90 minutes, so we could properly see Oxford and then on to Ruatha and enjoy it and the castle, rather than no time in Ruatha. We had a great time visiting England! Superb job by Collette..great trip! Collette really does a great job! Our tour guide,****** was absolutely wonderful! We had a fabulous driver and they made our trip so enjoyable. The sites were great (Highclere was especially a treat), every accommodation was comfortable, no complaints! Excellent! Where do I start? Everything was wonderful! Our favorite part was Rookery Hall - beautiful scenery and lovely accommodations. Our only complaint is that we would have loved another day there! Another high point was Highclere Castle. Covered a lot of territory and enjoyed the sights. Did not rate higher because did not think the tour manager was very good and thought some of the stops were less than satisfactory - for example Oxford where we were just turned loose with no guide. Most memorable experience was Stonehenge. I was very disappointed with the guide. We have had better ones in the past. Very seldom did he give us any info on what we were seeing. Thanks for your feedback Ralph. We have passed along your review to our Tour Manager Team Leaders. Trip too rushed. Not enough time in places. Worst trip I have taken with you. Have taken 9 tours in all. The trip was too rushed and didn't spend enough time in the towns. Way too much time on the coach. The hotel in Edinburgh was the pits. The area around the hotel was dirty. It was difficult to use the toilet in the room. The toilet had its own room and it was hard to open the door. Also the tour director and the bus driver were not getting along and that was something the guests shouldn't have had to deal with. I don't have much faith in taking another trip with you. Hotels were not up to par. Optional and included meals were to long. Meal times were two and a half hours to three hours in length. Not fun finishing a meal at 9 to 10 at night and then up at 5 or 6 in the morning. Bus was too crowded and seats did not have good leg room-especially the seat to the back of the back door of the bus. Thank you for letting us know about your recent tour, your feedback is incredibly valuable to us. Please accept our sincere apology for the conditions you experienced at some of the hotels on tour, as well with the tour guide and driver. We have also let members of our tour manager and product development team know about your experience. They will be reviewing this feedback and using it to improve this tour for our future guests. We are thankful for your business and look forward to seeing you on another tour. Great itinerary & food. Hotel location & accommodations good except York. Wonderful tour, lived up to title "British Landscapes"
We arrived in London a day early to experience the city. We were expecting a Colette presence in the hotel - there was none. We couldn't figure out from the description in the packet what to expect on the first day and what we should try to see on our own. I finally got a hold of our tour manager and he put a packet under our door - which we found out wasn't even complete. Our first trip to England so we were excited to see the difference in cities, the landscape and learn more about the history of the country. Interesting to realize a large percentage of the buildings have stood for 500 years. 1. the distance from the airport to first hotel was 2.15 hr. – a couple of hours going through customs in London Heathrow, after an all night trip, was exhausting. 2. the long coach distances during our tour from point A to point B were too long. 3. there was not enough time for shopping and not “trinket” shopping was what we wanted. 4. the tour manager and coach driver were at odds with each other. The coach driver could have been more groomed with “teeth”!! 5. the final hotel back to the airport was 2.5 to 3 hrs. drive - having to arrive at the airport a minimum of 2 hours and finally the flight home at 7 hours was all extreme. This particular tour was exactly what I was concerned about by taking 'bus tours' - up every day at 6 - luggage out by 7:30 - breakfast and ON THE BUS by 8. 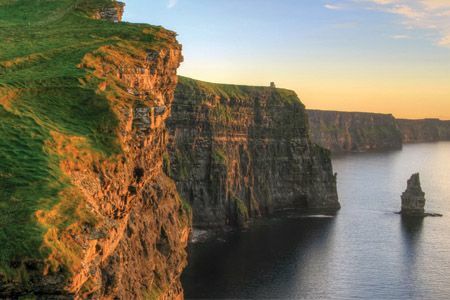 Our previous Ireland trips were much better paced. Thanks for sharing your feedback with us about your recent tour. A member of our Guest Relations team will be reaching out to learn more about your experience. We have also passed this along to our product development team for review. Thank you for bringing this to our attention. Overall the tour was very good. The tour guide was very informative and knowledgeable. I could not rate as excellent due to the following reasons, our room at the Grange City had the curtain holder screws coming out of the wall and it appeared that someone had been fixing something and left the screws on the window ledge, when I went to close the curtain, the screw fell out. The beds were very hard. Not overly impressed with the Grange City, had stayed at the Apex and was more impressed with it. Our hotel room in Stratford was in need of repair, the drywall tape was split, there were actual space between the drywall and it is was painted over, there was holes in the baseboards, the room appeared dirty, there was an oscillating fan in room that had clumps of dust on the front of it (a good maid would have at least run a cloth over the cover to clean and remove the clumps of dust), the corner of the baseboards by the windows had black stuff on it, not a little bit, a lot. Very disappointed in the room. Loved Ruthin Castle, however, would suggest to management to have cleaning staff wipe down white cupboards as dirty finger prints were evident around the door knobs. If it had been one or two, wouldn't care, however, around the knob and the knob looked grubby. Which really took away from the room. The coach driver did not know the route and he and the tour director would argue about the route. Not the most professional way to behave. As well the driver answered his cell phone while driving and input GPS info while driving. Could the route not have been discussed before we boarded the bus. Our first meal of the tour, my husband did not receive his dessert until everyone was leaving. I had told the waiter I was gluten free and received desert with cookie crumbs on it. Sent it back and did receive new dessert, however, had to eat quickly and share with my husband as everyone else was finished. The Scottish Dinner, the York Dinner where wonderful and would recommend to others. I am a travel professional, I would be concerned in recommending this tour to my clients based on the hotels and motor coach driver. Overall really enjoyed tour. Loved the Lake District and Grasmere and would like to spend more time in the area. Bourton on the Water was worth the stop, wouldn't have stopped if on our own. The pub at the Hadrian's Wall stop was excellent. The Scottish Night out was lots of fun and would recommend. Enjoyed so many things about this tour, the dinner at Shakespeare's daughters home was wonderful, Ruthin Castle is a recommend would have like to spend more time here as well. We will be careful about our next trip with Collette. We appreciate your feedback and apologize about your recent experience on tour. We have passed your review on to members of our product and tour manager teams so they can review and follow up on these points to improve the tour for future guests. Thanks for bringing this to our attention. I wrote a letter to Collette telling of my safety concerns with our bus driver going too fast on two-lane roads. They informed me that they passed my concerns "up the line".....which really tells me nothing. I felt that our safety was jeopardized more than once due to speed AND almost rear-ending two cars in two incidents. Our tour director was much aware of this. As a group we felt that we rode on the bus too much. Last year in Ireland my group of six (out of 38 on the tour) enjoyed our tour very much. This tour....not so much. As for the English countryside......it's just as beautiful riding through parts of NH, VT and the Berkshires of Massachusetts! Yet we did enjoy the tour.....just not as much as we had hoped.....and may not do any more bus tours with Collette. The activity rating was "3".....same as in Ireland. Yet our tour director liked to walk, so his "stroll" could turn into quite a distance for many of us. Walking the hills of Edinburgh was not appreciated by those of us who were expecting less. We rode on the bus way too much! Shorter days on the bus would have been much better. Perhaps different routing would have saved us having to ride so much. When we were in Oxford we could have visited Stonehenge.....not having to ride there from Stratford! Very interesting and informative trip since I am part Scottish & Irish. Hotels were great, your guide Chris was very nice and full of fun and information. Ricky, the coach driver was so nice. He was a Dear. I would have liked more free time but that was my fault for signing up for all three optional tours. Very well planned and organized. Tour Guide & bus driver were very good. I am hearing impaired so if the Tour Guide would post a white board in the lobby of hotel for time(s) that evening and next day, this would be very helpful. GoAhead Tours does this. As we move around in bus, it is far more difficult to determine what applies immediately and what us coming up! I had envisioned more time in London. Had jet lag so the 4 hour London Tour was good but I had wanted to do the London Eye. Little time for any shopping except in Cotswolds. A great overview of British history and landmarks! I love to travel, and have travelled with Collette many times in the past ten years,..well-located hotels, good pacing of activities, and excellent food are a few of the usually excellent factors for choosing Collette. The pacing with this tour was a bit scattered,...too many destinations with not enough time in most. The Edinburgh Novotel was a disappointment, .not up to what I've come to expect from Collette. Our tour manager, Chris, was wonderful! 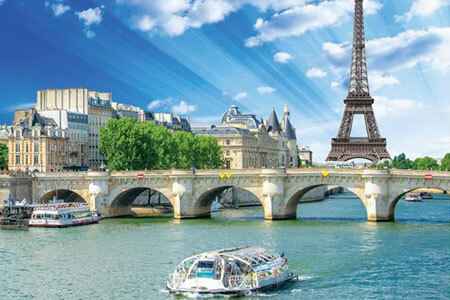 Excellent itineraries and guide . Enjoyed all of the dining options and our coach driver was excellent. 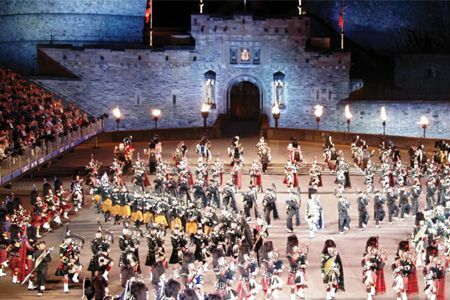 The Military Tattoo in Edinburgh was beyond description, simply awesome. Excellent service. The tour manager was right on time, all reservations were ready for our group, we could just walk right in the venue we were going to. Excellent Tour Manager. I would definately travel with Collette again. Food was wonderful. A very nice mix of traditional English yet one could always choose healthly. It wa nice to sit back and leave the driving to someone else. Instead of having to have my nose burried in a map, I could watch the beautiful countryside. Throughout the entire process, Collette staff was good at informing me about the features and activities of the trip and giving helpful suggestions about packing, etc. it was a surprisingly good mix of panorama and focus. We arrived early ahead of the tour group and stayed late on an extension in Paris (not part of the tour). Nevertheless, I knew where to be and who was picking my wife and I up at every transfer point from departure to return, and all of this went off without a hitch. The tour manager, was exceptional in every respect, and my wife and I give him high praise for making the whole experience more informative, more interesting, and more enjoyable. There were so many...I would single out the Military Tattoo, which was awesome, along with the trip to Highclere Castle, which was fantastic. Excellent trip..First class. Our tour guide and bus driver were the "best: would travel with Collette again. The Edinburgh Tattoo and the selection of resturants, the tour guide. The guided tour around Great Britain was pretty good, although we felt we left on our own quite a bit. We got lost a few times and had trouble finding places to eat. The extension to Paris was bad. The hotel was good, but located in a very bad part of Paris. There were protest gatherings in the plaza (loud speakers, huge crowds), grefetti every where,lots of homeless people degrading the area from sleeping on the benches to using the bathroom on the sidewalks and alleys. Very uncomfortable and downright scary at night. We couldn't find good places to eat. The big red tour buses were good once we were able to get on them. The pickup stops were a long way from the hotel, and we had a lot of trouble finding them. We were basically on our own and got lost several times. Really not an enjoyable experience. Thanks for reaching out! A member of our guest relations team is going to be reaching out to discuss your feedback. I like Collette as they give you free time in the cities we are staying in. The tour manager gave us a lot of information about the areas we were in. Wonderful, wish it had been longer. This is my 5th trip on a Collette Tour, all have been excellent. 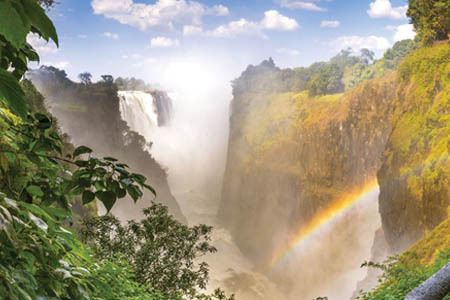 Excellent tour managers, well versed in the tour sites and very attentive to the customers. Wish we had more free time in London to see the interiors of some of the landmarks. Awesome experience! I was able to have a cousin living in N. Yorkshire visit me at the York hotel one afternoon! All went well with the tour, very well organized. Tour Manager was great and very knowledgeable. The only issue was changing the bus tour of London/changing of the guard scheduled for the second day in London due to a cyclist event. The tour was on our final day in London and this made it difficult to get to see some things on our own because time was short. I think visiting West Minister Abbey should be included in the tour. We were told that it was open until 4:30, but unknown to us, the line was cut off at 3:30pm and we didn't know this and were disappointed not to be able to get inside. This fact needs to be shared verbally and in printed material. I loved all the palace and castle visits including Highclere, of course. Our tour guide took a group photo here as well! The walking tour in Edinburgh was fantastic, as was our local tour guide. The welsh harpist at Ruskin castle was a delight and so personable. I enjoyed the Scottish night out entertainment, but our view was obstructed. Fine hotels, very nice fellow passengers, great driving with *personal details removed by Feefo* was a fabulous tour leader and companion. He was full of knowledge and suggestions and friendly helpfulness. Saw so very many fascinating things. Arriving home a day late (after the Delta melt down), with no bag and only 6 hours sleep in the previous 48, everyone I met commented on how well I looked! It was because I was so happy since I'd had such a good time ! Can't pick just one--Ruthin Castle, Shakespearean scenes in the garden, getting to sing at Scottish night, Windsor Castle, Stonehenge on a grey day on Salisbury plain. . . . And I particularly liked the things I did myself: tea at Fortnum and Mason's, Hamlet at the Royal Shakespeare Company, Edinburg's real Mary King Close. . . . This really was a taste of Great Britain --- really got a good feel for each place visited! Overall, wonderful. Suggestion --- this is the second Colette tour. I really would like the first night dinner be more private where all tour participants could meet each other. Maybe have a share time, name and where u are from (I made it my goal to talk and introduce myself to all 41 people. It was hard! Also, a list should be available of all participants in welcome pack. Part of the joy of a trip for me is making friends with others. My pick up sedan to Los Angeles airport was A-1. Did not feel the pickup at Heathrow met your standards. When I was signing up for the tour, I had a few questions so I called the customer service number. The representative was very helpful and walked me through every step while on the phone. She offered to get airline tickets for us and the price was less than I had found plus we had transport service to and from the airport. The trip was well organized and ran effectively throughout the tour. The tour manager and bus driver were knowledgeable and professional; we always knew we were in good hands and what to expect each day. The city tours in London and Edinburgh were good overviews but we didn't have time to go to many places we saw and learned about in passing. London was busy at this time of year so lines were long to The Westminster Abbey and other places we would have enjoyed visiting in the afternoon. In Edinburgh, we were able to walk down The Royal Mile and visit some sites about which we learned on the tour. York was a delightful city with interesting history and great food, especially The Sunday Roast with Yorkshire Pudding, only available on Sunday, of course. We enjoyed the Castle in Ruthin and seeing the beautiful countryside with rolling hills and sheep. We enjoyed the Avon River Cruise, seeing Shakespeare's home, and walking around Stratford-upon-Avon and were especially glad we chose to see a play at the Royal Shakespeare Theater. Going to Stonehenge was definitely memorable although it was a long day of driving. 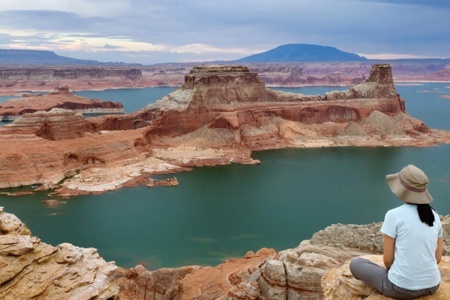 Overall, the trip was well organized and we saw a lot; now we can go back to the places we enjoyed most for a more in-depth experience if we choose. I can't say enough about how knowledgeable our tour manager was; she gave us information about the history, the economy, the agriculture and other businesses, famous people who lived or worked in certain cities, and told interesting tidbits about the countries we visited. I was certainly glad to see the sites that I did, however I feel for the money there should have been more major stops and more guidance. I felt my tour of Italy was far better than this tour of Britain. The guide this time around was friendly enough and professional but not really intresting and knowledgeable. My tour of Italy was fabulous and very very well guided. Our guide was extremely knowledgeable and super intresting, her name was YoVanka I believe. If I know that I would get Yovanka again I would consider another tour. Our bus driver this time around was not very friendly, it seemed like he didn't want to be there. I thought Ruthin Castle was a great part of the tour. I had a nice room and the food was great,very nicely presented. My daughter and I had a wonderful time. We appreciate all of the time, effort, and professionalism put into our tour. I would use collette again in the future! My favorite experience is Edinburgh! The places the tour set up for us, the entertainment, the food, and the amount of time on our own. Perfect! The tour was fantastic and the guide was very professional! I will travel with Collette again. I was very please with the overall trip. Signing up for the tour was brilliant, even with trying to add on to another couples tour. I was a bit miffed, when they called and said that I would have to pay an additional fee to get airline seats next to my traveling companion. I refused and when I called Collette, a different representative said that was not something they ever did. Although they ended up signing us up for a different flight and of course there was an additional cost for that. The tour guide and coach driver were great.Megan could be a bit pushy with trying to see additional tours, but I understand why. We had a hell of a time actually getting to the tour (airline troubles) and I was a bit put off that Collette was not able to offer any sort of advice on how to deal with the unexpected delays except for "make sure you file a claim". Once we arrived everything was smooth. I would (and have) recommend them and will probably give them another go in the future. I missed the entire London portion of the trip due to airline issues so I cannot speak to that. Edinburgh was the best. I enjoyed how there was group activities as well as explore on your own time. 1000 miles is a lot to cover and the coach time was excessive, but gave us time to nap. I appreciated stopping every couple of hours for toilets and stretching legs. Stratford -Upon - Avon was a waste of time, unless you were a die-hard Shakespeare fan. It was a real down way to end a otherwise delightful tour. I wish we could have spent more time in Wales or the Lakes District. Time in Ruthin felt rushed. Drop off bags, 45 min til dinner, then a presentation gave us little time to explore the grounds or town at all. Then back on the bus first thing in the AM. Add another night there and drop a night it Stratford. York was amazing! The perfect stop! arrive, walk about with tour guide, afternoon to explore on own, then dinner out (optional excursion I HIGHLY recommend), with enough time to pop in the pub on the way back. Edinburgh was lovely and I adored staying in the old part of town. (Some goes for the London property). Plenty to see and do. (Don't let them pressure you into spending the extra money for the "Scottish Night Out" you can get Haggis most anywhere and for a lot less than $160! Another plus of the tour was that we did not have to wait in line for tickets for places like the castle, Stonehenge, etc. and the local tour guides were fantastic. So much history to learn and ours (Ann took us off the high a bit and gave us some real local color - much obliged for that! I never dealt directly with Collette, but rather with my travel agent, so I don't feel I can adequately review their service. Other than their having my mom's middle name incorrect on her flight (still not sure how that happened, but it was corrected through Collette and my agent) everything seemed to go well. We had a great trip even though we missed the first two days due to airline delays - Collette was great and made sure we caught up to our group. Some of the meals were just ok, some were excellent, and all of the included experiences were pretty good. My favourite tour was the walking tours in Cambridge and York, our locally guided walking tour in Edinburgh from the Castle to the Palace and our trip to Stonehenge. I loved the beautiful scenery when we were driving on the scenic routes. My least favourite optional was the Scottish Experience - I found it crowded and the caterer didn't seem to care about allergies and as a result I was ill following this dinner. The best optional was the "beer tasting" in York - the food and beverage were excellent, as were the hosts, and they were very accommodating. 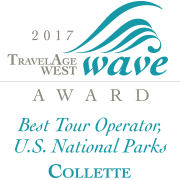 I have been on four Collette tours and I found each to be outstanding. It is a class act and I plan to tour again with Collette. We found everything outstanding. The Tour Guide was excellent. She kept us informed at all times and handled a difficult traveler in a professional manner. The tour did not allow enough time in London; we needed at least one more day. We came a day early and that helped. The locations we visited were well planned and the Tour Guides for the specific locations were very good, especially the one in Edinburgh (Sheilla). All the accommodations were clean and were in good locations. The one in London was too small, but in good location. The food ranged from very good to excellent. Unbelievable, amazing, and very enjoyable. I had a wonderful time. Nicki and Bryan were a fabulous pair. The memories will last a lifetime. From the tour guide to the bus driver I found them to be outstanding in the way they conducted the whole trip. The main reason I wanted to take this trip was to visit Highclere castle. I felt there was too much driving, going all the way up to Scotland, into Wales & back into England. I did not like the fact I had to arrange & pay for transfers back to the airport. Had a wonderful. Our tour guide is so patient and did all she could to accommodate all of us. She is very knowledge and kept us entertained. I felt that I got a great experience for the money, but the hotels at the end of the tour were less than great. For the money that was spent, they should have been of a higher quality. Overall though, I was very satisfied with the organization of the tour and my guide was fabulous. Andy was the driver, and he was spectacular as well. It was a great tour, with spectacular visits to Scotland and Wales. My favorite experience was being in England during the celebration of the Queen's 90th birthday! I do think that the hotels could have been a bit higher quality. 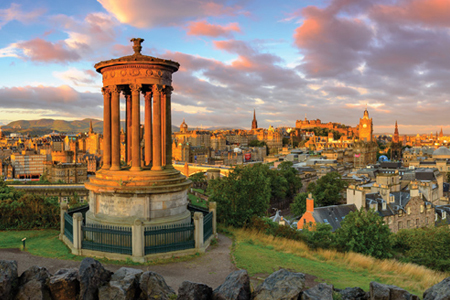 See the world-famous Royal Edinburgh Military Tattoo and tour the English countryside, surrounded by sleepy villages and lakes set amidst mountains that have inspired centuries of literature, and cities thriving with British art and culture. Air passengers will arrive and depart from London airports. On day 9, all transfers will depart from Stratford-upon-Avon for the London airports. *The Palace of Holyroodhouse may occasionally be closed when the Queen is in residence or for official state functions.